During this journey I've had to chew on and digest a few pills that have proved to be very hard to swallow. The major financial compromise associated with moving from relatively new 35mm and medium format camera kits to a new digital system was certainly tough. Replacing my Canon 5D Mark II camera and six excellent lenses with a new Nikon D800e kit was also difficult. The image at the top of this post featuring two fisherman heading out, under the midnight sun, into the spectacular Ilulissat Icefjord in Greenland was made with my Canon 5D Mark II camera and a Canon 24-105mm f/4 IS L series lens at 105mm. While I had a variety of lenses, including prime lenses, for this camera the 24-105mm f/4 was a great travel lens which I used extensively for portrait, architectural and landscape photography. By the time I moved to a Sony a7Rii camera I was determined to reduce the amount of lenses I purchased, at least for the first few years, in case another brand change followed soon after. So why make the change? It's all about that never ending search for quality. I considered the Nikon D800e camera to be capable of delivering the highest quality possible of any 35mm-like DSLR camera, at the time, for tripod based landscape and architectural photography. As I'd owned two Canon 5D models previously it, clearly wasn't a decision based upon brand bias. Moving to the Nikon D800e was a totally logical decision based upon the perception of improved quality and an expanded HDR workflow. While the high pixel count of the Nikon D800e points to its ability to produce big prints of stunningly quality, it's the technology associated with the camera's sensor that allowed it to record detail, in shadows and highlights, under relatively high contrast conditions that separated this camera, and its sibling (i.e., Nikon D800), from all other cameras in its class. 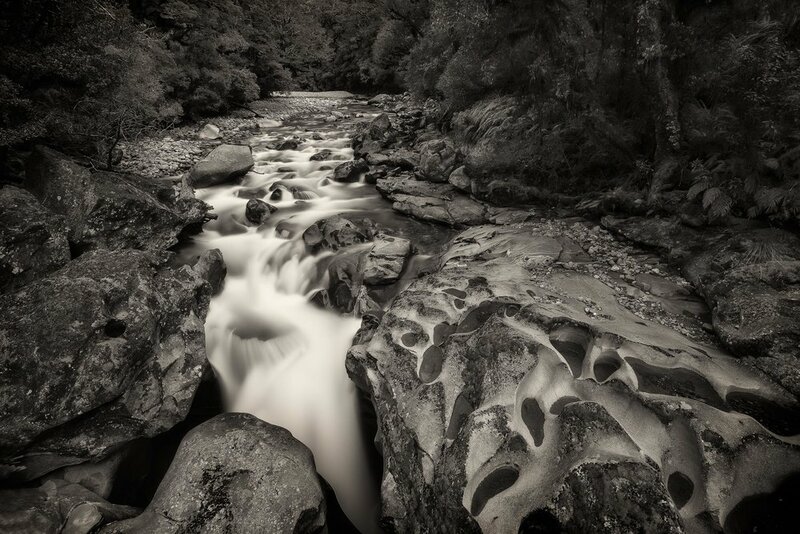 The image of the fast moving river near Milford Sound in New Zealand was made with the Sony a7Rii camera and the excellent Sony 16-35mm f/4 lens at 16mm. Paired with applications like Lightroom and Photoshop the ability to produce high quality results, from images made under high contrast conditions, had never been easier. A serene scene of farm houses around the edges of a lake on the island of Suduroy in the Faroe Islands. I've looked closely at the Four-Thirds (i.e., 4/3) format. While there are great Four-Thirds cameras from Olympus and Panasonic, I'm not convinced that this smaller format is right for the images I make. I prefer the lower noise levels and ability to produce larger prints associated with full frame cameras such as the Sony a7Rii camera. But each to their own. The Panasonic Lumix cameras are excellent for video and the still images from the Panasonic and Olympus Four Thirds mirrorless cameras would more than meet the expectations of most amateur and enthusiast photographers. I've become a huge fan of mirrorless cameras and believe that, for most folks, they represent the future over the short to medium term. Beyond then we'll have to see what's introduced in years to come. But I remain a full-frame advocate and Sony, given its quality and price, is the best option for me. I was very happy to acquire a Sony a7Rii camera in addition to Sony/Zeiss FE 16-35mm f4 and Sony/Zeiss FE 24-70mm f4 lenses in late 2015. I'm extremely happy with the functionality of this new system and the results are excellent. In March 2018 I added a Sony RX-100V camera to my kit. It's a very small camera with much of the functionality of the larger Sony a7Rii camera, yet at a very affordable price. Though the sensor is only 1 inch the quality of the files, particularly at low to medium ISO's, look great. It's going to make a very good everyday camera and a decent backup camera when I'm travelling.